Limited to 300 vinyl copies, never to be repressed. Don't miss out on a piece of PHILLY HIP HOP HISTORY!!! 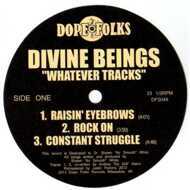 Recorded in 1992-1993, "WHATEVER TRACKS" is 6 songs from the DIVINE BEINGS' shelved debut LP. 5 previously unreleased songs + the track "LOYAL LANDLOVERS" from their hard to find debut 12" single. This record is solid early 90's Philly flavor with guest spots from ?uestlove and Black Thought from THE ROOTS!! !